Since last two years Kalinger T.V. is becaming more popular T.V. channel in T.N. actors. Now it is clear from the CBI documents that some of the 2G Specturam amount has been funded in Kalinger T.V. 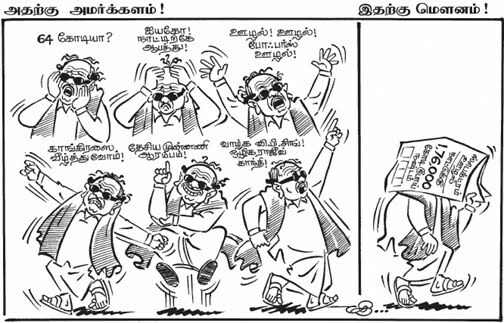 Srinivasan thanks for sharing this information and cartoon was really enjoying and ridiculing the pathetic condition of Kalaignar stand on 2G Spectrum scam. On the day when Raja was arrested , that news was totally blocked out as if nothing happened in India. That clearly shows and have the benefit of doubt that Kalaignar tv might have got kick backs on 2G spectrum. This is not as a whole Kalaingar TV got 200 Cr, but it is that One among the many in Kalaingar Tv has got Rs.200 Cr, and if investigated as whole it could turn around a huge sum of money in the whole part of M.Karunanidhi. So the CBI should next turn aound here to investigate and find the real truth without leaving the handholed investigation of A.Raza and his officials.